Newtown Castle is 1.5 miles (2.5 km) southwest of Ballyvaughan, in County Clare, Ireland. The drive through the Burren to get to the castle is beautiful. The striking rocky ground is stark against the Irish sky. When I visited the area, I stopped at the Poulnabrone Tomb for a look at the interesting ancient burial site. 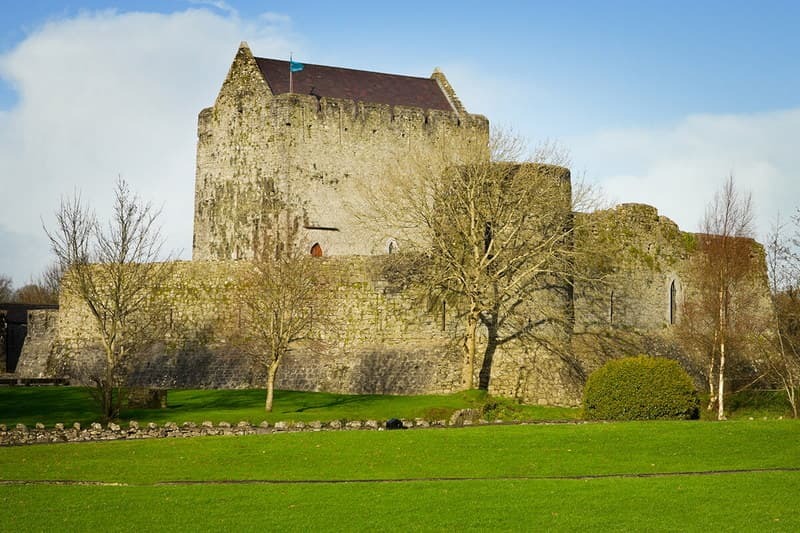 Newtown Castle is a 16th century fortified tower house built for a branch of the O’Briens but passing after into the possession of the powerful local O’Loghlen (sometimes spelled O'Loughlin or O'Lochlainn) family. 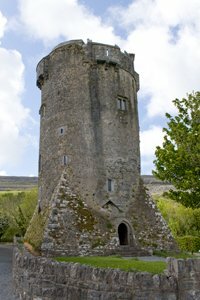 In the 1830s, Charles O’Loghlen occupied the castle and was known locally as “King of the Burren”. 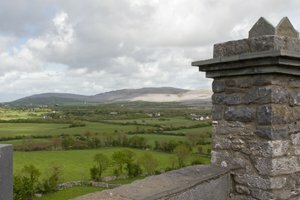 Toward the end of the 19th century, Peter O’Loghlen occupied the castle and was known as “Prince of Burren”. Newtown Castle was still inhabited by the family at the end of the 1800s. It later fell into ruin and was restored as an exhibition center for the nearby Burren Art College. The castle brochure states that three masons, five carpenters and seven general workers hammered and sawed and built six days a week for three months until the roof was finished. The roof cone, made of seven tons of Irish oak, was lifted into place in June of 1994. The castle is a round tower house set on a square pyramid-shaped base, so it looks a little like a rocket ship. A spiral staircase links the five levels. 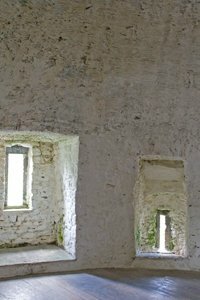 The ground floor of the castle was used for storing food. The circular main chamber has twelve foot thick walls that helped with preservation of food. The first floor has narrow windows with gun loops for defense. The second floor has three gun loops and a door from which occupants could exit the castle by a 30 foot ladder. The third floor of the castle is the Main Hall. From the balcony, you have stunning views in each direction. 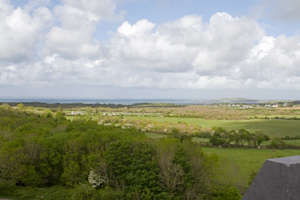 To the north, you can see Galway Bay, Connemara and Ballyvaughan village. To the south you can see Corkscrew Hill and valley. To the east is Aillwee Cave and to the west, you can see Newtown Trail. Adjacent to Newtown Castle is Burren College of Art, a beautifully situated art school. Newtown Castle is located on the N67, about 3 miles southwest of the intersection of R480 and R477, just southwest of Ballyvaughan. It will be on the right on N67 as you travel from Ballyvaughan to Lisdoonvarna. You will want to spend a bit of time in this beautiful area of County Clare. You will be near the Cliffs of Moher, the town of Doolin, and the Aran Islands, just to name a few wonderful destinations. Near Newtown Castle on the R480, you will see the entrance of another popular spot called the Aillwee Cave. If you are in this area of County Clare, you will want to explore the cave and have a snack or lunch at the tea room and restaurant. After visiting Newtown Castle, I went in to Ballyvaughan and stopped at a shop where I bought a tasty sandwich and a leather wrist band crafted by a local artist. There was also an internet café and gas station located at the crossroads. If you'd like to check the car rental prices for your tour of Ireland, you may want to use this form to get a quote from Dooley Car Rentals. I have used this company and have been happy with their excellent service. In the meantime, to get in the mood of Ireland, you may want to order a cd of original Irish music by the group called De Dannan. Amazon.com has their music collection along with many other Irish groups you can enjoy in the comfort of your own home.